It was a warm sunny day in Kirkwall on 22 July 2014 when a small group gathered at the back wall of St Magnus Cathedral kirkyard to commemorate the death of Dr John Rae in 1893. 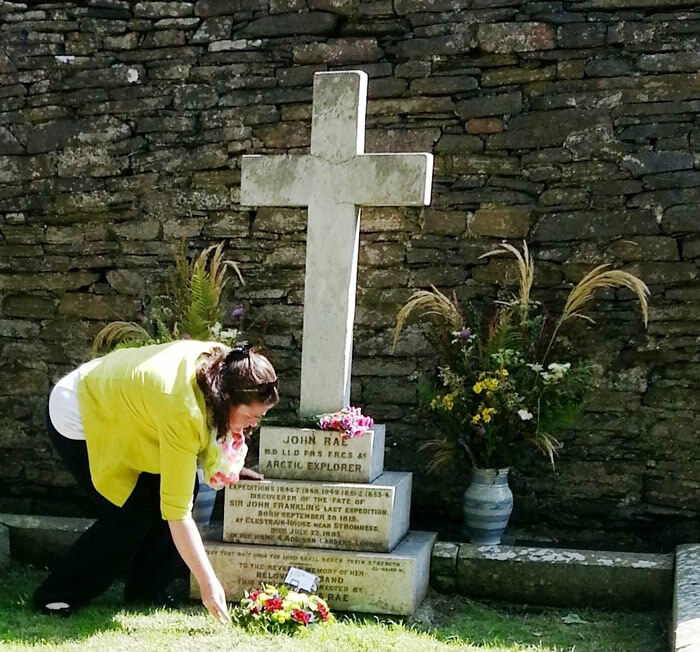 The grave itself had been tastefully decorated with wild flowers and the gravestone looked much improved after the spring cleaning by Trustees Colin Bullen and David Reid. On the stroke of 12.30pm, Andrew Appleby, President of the John Rae Society, welcomed all in his usual casual, friendly manner and briefly highlighted the Society's activities and ongoing projects before introducing the Rev. 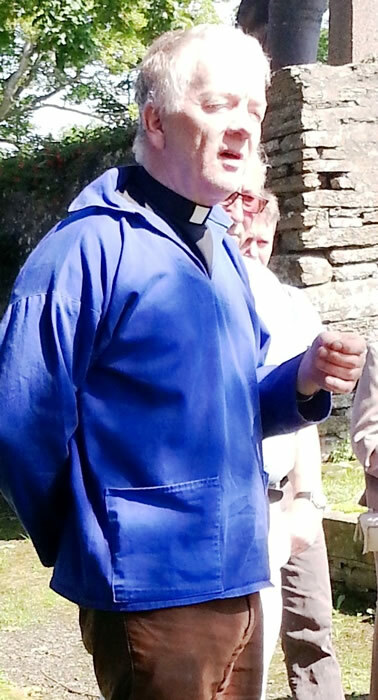 Fraser Mcnaughton, Minister of St Magnus Cathedral. Rev. Mcnaughton gave a wonderful eulogy emphasising the humanitarian attributes of Dr Rae in his dealings with the native indigenous peoples which has considerable lessons for us all today. He also commented upon John Rae's prowess with gun and proficiency with snowshoes which would have made him a Victorian bi-athlete of such stature that would have guaranteed Scotland a gold medal at a winter games, had they been held in those days. He concluded by observing that none of the other graves in the kirkyard have people commemorating them after more than two hundred years which was perhaps the most telling observation on the stature and esteem of Dr Rae. His tribute was greeted with applause. 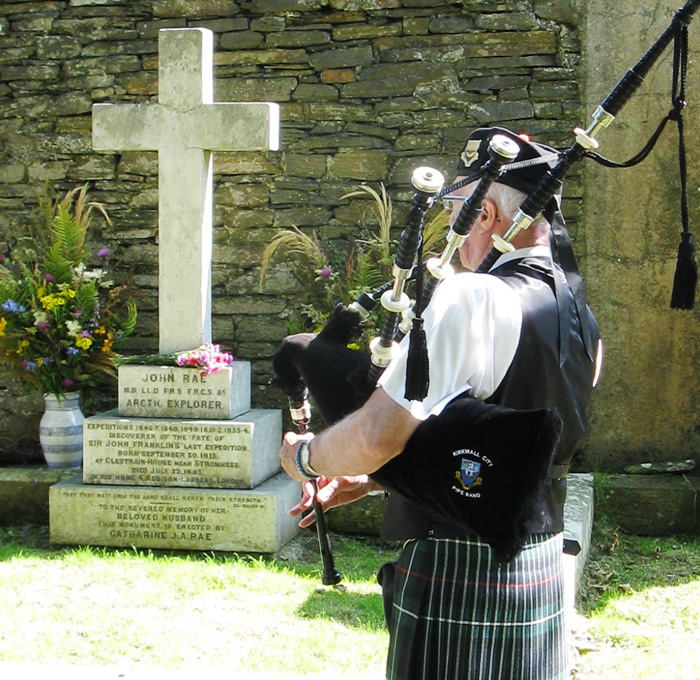 On behalf of the Society, Mrs Denise Bullen laid a wreath in the colours of the Orkney Flag and the ceremony concluded with Brian Findlay of Kirkwall City Pipe Band playing the traditional Scottish slow air, "My Home" at the end of which he saluted one of Orkney's greatest sons. Before the crowd dispersed Andrew thanked everybody for their attendance and wished them all a safe journey home. The Society wishes to thank our anonymous flower arranger "S", Rev Fraser Mcnaughton, Mrs Denise Bullen and Mr Brian Findlay for their co-operation and help prior to and on the day itself.